Happy January! I hope you like my monthly Hedge a grams. Besides random thoughts, I like to report on my artistic work every month, and I call it a Hedge-a-gram. When I was quite young I wanted to be a children’s book illustrator, and I would have loved to be connected to someone who was. Because it is the New Year I would like to add a personal reflection on a new beginning as well. I was lucky to have parents that encouraged using our imaginations. When I say, “our” I mean myself and my two younger sisters. My mother was a preschool teacher and was very wise about the lives of young children. When we were in high school she went back to a Junior College to take more courses in childhood education. She went to a junior college that was in a small town nearby. The teachers there were top rate and had great expectations. Seeing my Mom go back to school and be so invigorated made a lasting impression on me. Children always fascinated my mother and her basic rules for us meant we should be reading, playing games, drawing, or being outside. We could have two TV shows only on Saturday morning. In those days we could safely ride our bikes all over our town and explore the woods and fields. There were trails all through some of the larger undeveloped tracts of land, and I often wonder who made them and used them. I became a children’s book author and illustrator, and my youngest sister did too, Jeannie Brett. My sister Sophie became an amazing 6th grade teacher, and now a Speech Pathologist. I am happy to say my Mom lived to see my sister follow in her footsteps and the other two of us be involved creating children’s books, her two great interests. Once in a while events happen that coincide in a unique and productive way. This chain of events began around New Year’s and I want to write about it. My husband, Joe and I traveled to Albuquerque, New Mexico to see his son and their family. Because they have four children and have no free bedroom, we stay at a resort nearby, called Tamara Hyatt Regency. This hotel is part of the Santa Ana Pueblo and is very beautiful. There are trails through a Cottonwood woods that open up to the Rio Grande, and a beautiful stable in the shadow of a mesa sacred to the Tamayame people. This stable is very well cared for, and the rehabilitated rescue horses- at least 60 head, are like a who’s who of the horse world. Gorgeous Belgiums, Haflinger, Mustang, Paso Fino, a Shetland pony, and more than you can count Quarter Horses in all their gorgeous color combinations live in this beautiful place of sage and grasses. In the hotel, many of the staff are Native Americans and the decorations in the rooms and public spaces are traditional textiles, pottery and Native American painting. In our room we had a pottery bowl with a beautiful chicken in black and terra cotta red on cream background. As if that were not enough there was a beautiful horse and warrior painting in the traditional style. Along with the hedgehog and horse, chickens are a favorite of mine! 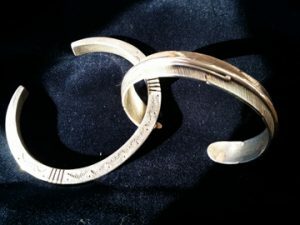 For a few hours on weekends a Navaho silver artist named Michael visits the lodge and sells his jewelry. He also brings his tools and shows how he works. Last year I wanted to buy a piece, but he was thoughtfully explaining his process to another guest. This year I was lucky and bought a Eagle feather bracelet, because I want it to remind me of my chickens, they both have feathers after all. Another bracelet caught my eye, called a prayer bracelet. On the sides you can see motifs of mountains and grasses in three groups. Michael told me that the tradition was to face sunrise and say the prayer, again when the sun is at its highest, and one more time as the sun sets. This is an excerpt from the prayer, which I got from the Internet. One starts facing east and turns clockwise to the south, west, north and back to east again. When I got home, I woke up and faced the sunrise, but since it was 5 degrees I did it from my upstairs window. 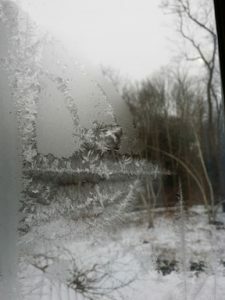 I noticed all around that window frost flowers had formed in beautiful patterns. Then I went off to check on my chickens and pack for a road trip to Vermont to meet my daughter and her family for skiing. Just before leaving I snapped a photo of the frost patterns. When I got home I painted them in on the book jacket of THE SNOWY NAP. The frost flowers were just the touch it needed. I really love to stop and think about beauty three times a day in a purposeful way. It really nourishes me and I get energy from it. The web has some very beautiful Navaho and Native American prayers on it. When I went back down to buy my second bracelet from Michael I showed him an article I had just read in Outside magazine about a Navaho track coach who organizes a 55k race in Arizona’s Canyon De Chelly. The special thing about this long distance race is that the singlet you wear in order to be in the race enables you to follow the course through sacred land, a beautiful canyon. It turns out that Michael, even though he lives in Albuquerque now, went to that same high school. The race is a little too long for me, but I got a good start on my training by running a 9 miler in my old town next door where I grew up on New Years day. It was 12 degrees but I was warm as toast with all my layers. I am late, late, late with getting in the finishes for THE SNOWY NAP, but I am revitalized and very happy with my new work, especially the frost flowers! I love that the New Year means new beginnings, and I wish you all the best in 2018 and a fresh start and renewed energy in your creative life. I love August because so many in our family are born in August, and are Leo the Lions, my husband Joe, daughter Lia, daughter-in-law Catherine, and Grandson, Gavin. We are out in the Berkshire Hills of Massachusetts for the summer, as my husband Joe, plays the Double Bass in the Boston Symphony Orchestra. I have several children’s books with musical themes, BERLIOZ about a bass playing bear, and GINGERBREAD CHRISTMAS, where inside you can see instruments of the Symphony Orchestra made of gingerbread, as well as the gingerbread baby himself. Much has been written about art imitating life, and how the everyday world inspires the imaginary world or when the two merge. An interesting incident happened as I was hard at work on my new book THE SNOWY NAP that is a curious example. My studio is part of a sprawling log cabin set up on a cliff overlooking Goose Pond. I share my studio with Little Snow, who became our pet when I needed a model for the white rabbit in THE ANIMAL’S SANTA. He lives in a fairly large, open area in the cabin also made of logs, raised up on legs, and he is close enough that I can look over my shoulder at him. You may have seen him when I went on the three week book tour in 2014 on our bus, he came too. I was intensely working, listening to an audio book when out of the blue there came a hard rap, almost a bang. We live in the woods and thought a branch had come crashing down on the roof over my head. I took a quick look out the windows, fore and aft, but didn’t see anything, so I went back to work. Again I was startled by a resounding, sharp, very loud rap, only this time, I realized it came from Little Snow’s corral. I got up again and realized he had thumped the floor with his strong back foot. We’ve had little snow for four years and he does all sorts of antics, but he has never made this very loud bang. I knew that wild rabbits thump the ground when they see danger to warn other rabbits so I checked out the windows again. It was morning, and the woods and lake were sparkling in the dappled sunshine. Little Snow seemed a little frozen in place, but seeing nothing, I turned to go back to work, peeking out the hard to get to window beside his pen as I did so. There was a black bear’s face looking up at me! The amazing thing for me was that Little Snow is a domesticated rabbit. I can’t imagine how many generations his ancestor bunnies have lived under human watch. Yet he recognized that the bear was not in his comfort zone. Then, not two days later, a friends brought their chocolate lab to visit. He ran into my art studio and looked right into Little Snow’s corral, it’s hinged door wide open. This time Little Snow ran to the other side but didn’t make his alarm thump. As long as we have had Little Snow he’s never even seen a dog. I am left wondering about animal intelligence and instincts and I am waiting for the next alarm thump to help with my theory that our pets have complex behaviors that are sometimes hidden from us. In THE SNOWY NAP, I overstate the interaction between Hedgie the hedgehog and the farm animals as my imagination takes my story into fiction. Hedgie takes a last ramble around the farm before the snow flies, and for him, hibernation. When the animals gently taunt him about what he will be missing, Hedgie tries to stay up to see winter. This doesn’t work out, and luckily, before he is frozen, he is rescued by a little girl who brings him inside for warmth and food. Outside, the animals can see his wonderful life inside as he views winter scenes from his cozy window. At the first opportunity the outside animals move inside! I am working on the finishes of THE SNOWY NAP, and the beginning pages are sequential. I have a book dummy that maps out the exact 32 pages the book will be. My next spread will skip ahead to one of the snowy scenes, and then I’ll do the farm animals and wild animals in the house scene which is uproarious and funny. The publisher, Penguin Random House likes to have a partial dummy to promote the book early on, way before the book is due which is why I do it this way. I love this stage of the book when I feel I can enter the world I’ve created, it seems real. I will probably get started writing the book that will follow. It is set in India, and has a tiger as the main character. The working title is THE RUNAWAY SLIPPERS. Four years as go I went to India and saw a wild tiger in a large game reserve from a jeep. It was very cat like and very large. You know when a tiger is on the move because the deer bark, and the monkey scream warning. Nothing can prepare you for the sound of that roar that makes hair stand up on the back of your neck, or the sight of the slinky, cryptic, majestic striped presence. When I’m not looking forward to the next book, I am getting excited about my first early book signing on Cape Cod. I hope Cape Codders will stop by their famous historic bookstore, Eight Cousins, to let me sign them a copy of THE MERMAID. It will have been just published. My usual national book tour will start the day after Thanksgiving. All the details will be on my website. I am about to send copies of THE MERMAID to Bailey and Tony at the New England Aquarium. They introduced me to “Sy”, the Giant Pacific Octopus who features largely in THE MERMAID. Every year I make a picture of a momentous day in our year for my husband. This year I painted us at the aquarium, the day of our amazing visit. I made copies for Bailey and Tony, only I think their minds are totally emerged in the fascinating work they are doing with the aquatic creatures that make up their world at the New England Aquarium. When I’m not painting I have been trail running on the stretch of the Appalachian Trail two miles from our cabin. The “thru” hikers, the intrepid people who have hiked from Georgia, are traveling North in large numbers this month. Upper Goose, the lake connected to us by a small channel has Appalachian club cabins for hikers to stay at if they choose. I really enjoy meeting the hikers who tell me their “trail names” which I then put up on my wall. The trip to Mt. Katadin in Maine from Georgia takes six months. It takes a lot of mental fortitude and physical endurance. They hike through weather extremes and with heavy packs. The tradition is that if you share the trail, or just want to show your admiration, you can offer trail magic. I tried to perfect my choc chip cookie recipe when my daughter was in Iraq as a US Marine and I was told my recipe was good, so that’s what I bring on my runs to give as trail magic. Here is my recipe, which is off the choc chip bag with a few modifications. I mostly concentrate on really good ingredients. I LG packet of Ghiradelli’s semi sweet choc morsels. Honcho, Shop Teacher, Chugging Along, All Aboard, Speedy, Night Hawk, Slim Jim, Bear Pop, Capt Bob, Hiking Home, Young Gandolf, Blue Bird, Dr. GO- MO, Ogi, Two Step, Pio, Stack, and Warden. I hope hikers stop at Goose Pond’s AT Cabins, I’ve only seen the cabins from the lake, but Upper Goose is a beautiful clear lake with great swimming. Good luck with all your creative projects, and Happy Birthday Leo the Lions! 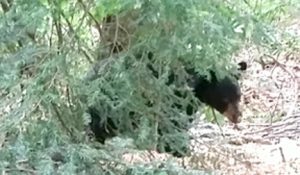 I hope the photo of the bear isn’t too fuzzy, I try not to get to close and allow the bear to get used to people. Then they will become nuisance bears and have to be relocated.